CARPE DIEM: No Real Estate Bubble in Central U.S.A.
No Real Estate Bubble in Central U.S.A. 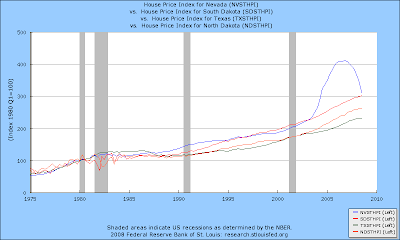 The top chart above (click to enlarge) shows the OFHEO House Price Indexes for Nevada, South Dakota, Texas and North Dakota, just recently updated through the third quarter 2008. 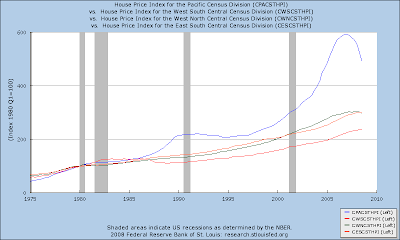 The bottom chart above shows the regional OFHEO House Price Indexes for the Pacific Census region (Alaska, California, Hawaii, Oregon, and Washington), the West South Central region (Arkansas, Louisiana, Oklahoma, and Texas), the West North Central region (Iowa, Nebraska, Kansas, North Dakota, Minnesota, South Dakota and Missouri) and the East South Central region (Alabama, Kentucky, Mississippi, and Tennessee). Bottom Line: The way it gets reported by the media, you would think that the entire country is suffering from the devastating effects of a real estate bubble, when in fact the worst problems are concentrated in a handful of states like California, Nevada, Arizona and Florida. The fifteen states in the three regions representing the entire middle part of the country have not experienced a real estate bubble, and the home price indexes for those regions show a historically consistent pattern of gradual home price increases over time, with a slight leveling off in recent quarters. So do you mean that a handful of states like California, Nevada, Arizona and Florida screwed up the world economy? [West North Central] regions show a historically consistent pattern of gradual home price increases over time, with a slight leveling off in recent quarters. Nice try. But the statement is false. West North Central Region - a repeat of the early 1980s double dip recession. West South Central Division - will it follow the mid-1980s oil bust? East South Central Division - it's the early 1990s recession show. Pacific Region - an unprecedented disaster. That market has stay relatively stable in Rochester MN ... but we have a constant stream of people moving in and out due to the Mayo Clinc. Gotta love anonymous comments that call you out as wrong especially when what they show at best shows minor differences in exactly what is happening. The real estate business is relatively affected by economic crisis. However, the effects on the real estate industry as well as on the economy are temporary as the new administration and economic stimulus is on the process. Though the real estate industry is increasing,the actual sales in the properties is actually unstable.